Finding Anita and Catnip has already been a godsend for our cats and our peace of mind – and it’s only been 2 weeks! We recently moved into the area from Greenwich and although we aren’t often both away at the same time we had 2 weekends in a row when did. Mabel our tortie gets very anxious on car journeys so the thought of a trip to a cattery was a bit if a worry. Thankfully I found the catnip website and Anita kindly came to visit the same evening to meet us and discuss arrangements. 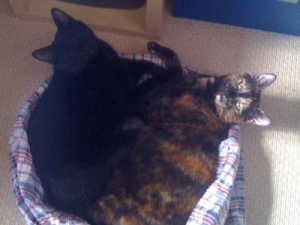 I warmed to Anita immediately and judging by the photos she sent us of our 2 cats whilst we were away… They have too! Both cats were very chilled on return, all bowls were clean and neat and they’d even acquired a new catnip toy to play with! Anita is a gem, very reliable, easy to book and pay online and extremely caring!